The San Gabriel Mountains, part of the Angeles National Forest. The southwest view from Islip Saddle shows Bear Creek, a tributary of the San Gabriel River that lies within the San Gabriel Wilderness, and Twin Peaks 7,761 feet (2,366 m). The national forest was established in 1908, incorporating the first San Bernardino National Forest and parts of the former Santa Barbara and San Gabriel National Forests. Angeles National Forest headquarters are located in Arcadia, California. The Angeles National Forest covers a total of 700,176 acres (1,094.0 sq mi; 2,833.5 km2), protecting large areas of the San Gabriel Mountains and Sierra Pelona Mountains. It is located just north of the densely inhabited metropolitan area of Greater Los Angeles. While primarily within Los Angeles County, a small part extends eastward into southwestern San Bernardino County, in the Mount San Antonio ("Mount Baldy") area, and a tiny section also extends westward into northeastern Ventura County, in the Lake Piru area. 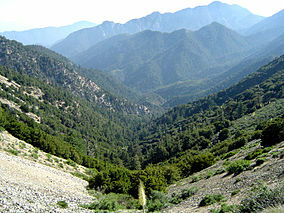 The San Gabriel Mountains National Monument, established in 2014 and managed by the U.S. Forest Service, is largely within the Angeles National Forest. The John D. Dingell, Jr. Conservation, Management, and Recreation Act of 2019 established the Saint Francis Dam Disaster National Memorial and Saint Francis Dam Disaster National Monument at and around the ruins of the St. Francis Dam in the Forest's San Francisquito Canyon. The San Gabriel Forest Reserve was established on December 20, 1892, the San Bernardino Forest Reserve was established on February 25, 1893, and the Santa Barbara Forest Reserve was established on December 22, 1903. Together, they became National Forests on March 4, 1907, and they were combined on July 1, 1908, with all of the San Bernardino forest and portions of San Gabriel forest and Santa Barbara forest composing the new Angeles National Forest. On September 30, 1925, portions of the Angeles National Forest and the Cleveland National Forest were detached to re-establish the San Bernardino National Forest. Angeles National Forest is registered as California Historical Landmark #717, for being the first National Forest in the state. The campgrounds at Broken Blade, Twisted Arrow and Pima Loops were closed on July 26, 2013 after squirrel infected with bubonic plague was discovered. In the Station Fire, more than 161,000 acres (650 km2) of the forest were burned by an arson fire that began on August 26, 2009, near Angeles Crest Highway in La Cañada and quickly spread, fueled by dry brush that had not burned for over 150 years. The fire burned for more than a month and was the worst in Los Angeles County history, charring one-fourth of the forest (250 square miles), displacing wildlife, and destroying 91 homes, cabins and outbuildings and the family-owned Hidden Springs Cafe. During the fire, two firefighters died after driving off the Mt. Gleason County Road looking for an alternate route to get the inmates out at Camp 16. 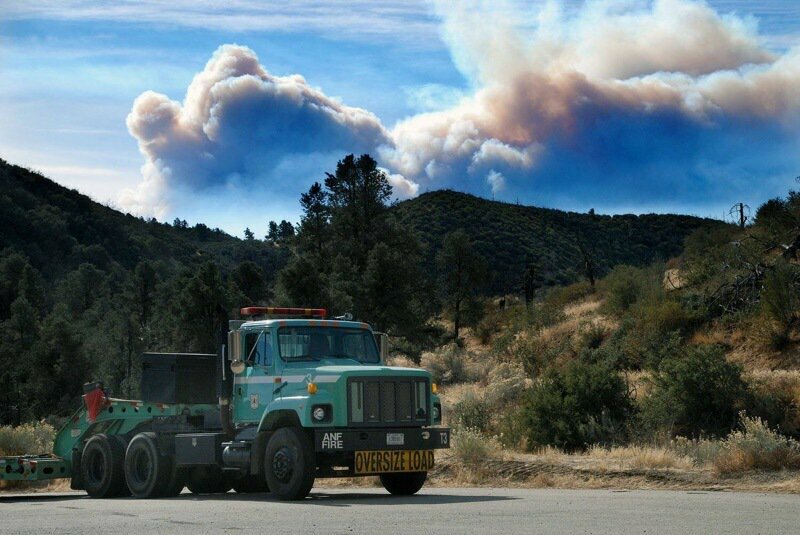 The Station Fire threatened the Mount Wilson Observatory atop Mt. Wilson . The site includes two telescopes, two solar towers, and transmitters for 22 television stations, several FM radio stations, and police and fire department emergency channels. Although the fire scorched one side of the outhouse at amateur-owned Stony Ridge Observatory, six miles northeast of Mt. Wilson, aside from minor damage from smoke and ash infiltration, the remainder of the observatory and its historic 30-inch Carroll telescope survived. Several 2012 wildfires occurred, burning hundreds of acres across the forest-covered mountain range. The Angeles National Forest manages the habitats, flora and fauna ecosystems, and watersheds. Some of the rivers with watersheds within its boundaries provide valuable non-groundwater recharge water for Southern California. The existing protected and restored native vegetation absorb and slow surface runoff of rainwater to minimize severe floods and landslides in adjacent communities. The land within the forest is diverse, both in appearance and terrain. Elevations range from 1,200 to 10,064 ft (366 to 3,068 m). The Pacific Crest Trail crosses the forest. Much of this National Forest is covered with dense chaparral shrub forests with oak woodlands, which changes to pine and fir-covered slopes in the higher elevations. Subsequent to the fire there was a heavy growth of poodle-dog bush, apparently triggered by the fire's effect on dormant seeds, that lasted for several years. The plant produces prolific lavender flowers. Unfortunately, as visitors to the Forest discovered, contact with it may cause a poison-oak-like rash. Tree species for which the forest is important include bigcone Douglas-fir (Pseudotsuga macrocarpa), Coulter pine (Pinus coulteri), and California walnut (Juglans californica). 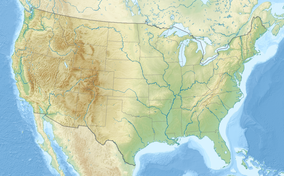 The National Forest also contains some 29,000 acres (12,000 ha) of old growth, with: Jeffrey pine (Pinus jeffreyi) forests and mixed conifer forests (Coast Douglas-fir (Pseudotsuga menziesii var. menziesii), ponderosa pine (Pinus ponderosa), and white fir (Abies concolor)), and lodgepole pine (Pinus contorta) the most abundant types. This forest is home to black bears, gray foxes, bobcats, cougars, and coyotes. A National Forest Adventure Pass is required for parking at many locations in the Angeles National Forest and other National Forests in Southern California, and this can be obtained online or from visitor centers and local merchants. Los Angeles County has declared that passes are not required on county-maintained roads. There are also many other areas that do not require the pass. Angeles National Forest, the two green areas north of Los Angeles. 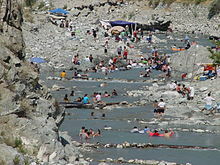 The east fork of the San Gabriel River is one of most visited sites in the forest system. Mount San Antonio 10,064 ft (3,068 m) — also known as "Mt. Baldy"
Pyramid Lake is located next to Interstate 5 (take Smokey Bear exit), 20 miles (32 km) north of Magic Mountain Amusement Park in Valencia, California. Elizabeth Lake is located approximately 10 miles (16 km) west of Palmdale, California, on Elizabeth Lake Rd. Montane chaparral ecotone with the Mojave Desert. Yellow sulphurflower buckwheat flowers in foreground. ^ a b "Angeles National Forest". Office of Historic Preservation, California State Parks. Retrieved 2012-10-07. ^ "Trump's signature means St. Francis Dam memorial is coming". Ventura County Star. Retrieved 2019-04-01. ^ "Plague squirrel closes Calif. campgrounds". USA Today. July 26, 2013. Retrieved 26 July 2013. ^ Lockman, Ronald F., 1981. Guarding the Forests of Southern California: Evolving Attitudes Toward Conservation of Watershed, Woodlands, and Wilderness (Glendale: A. H. Clarke). ^ "Angeles Passes and Permits". Angeles Permits. Archived from the original on 9 March 2008. Retrieved 2008-02-14. Russ Leadabrand, A Guide o the San Gabriel Mountains of California (L.A.: Ritche Press, 1963). John W. Robinson, The San Gabriels: Southern California Mountain Country (San Marino: Goldwest Books, 1977). W. W. Robinson, The Forest and the People: The Story of the Angeles National Forest (LA: Title and Trust Insurance co., 1946). Wikivoyage has a travel guide for Angeles National Forest.